A strange thing happens when humans look at clouds. We arrange the information we’re seeing into an image we can recognize. A leaping horse, a lizard, a heart, a rabbit. No matter how long it’s been since childhood – since we had the capacity to imagine a stick was a sword, or a fort was a castle ­– that part of our imagination, our whimsy, hangs on. There’s even a word for this phenomenon: pareidolia (try using that in a sentence). The effect isn’t limited to clouds either. Spotting the man on the moon, or the Disney character Pluto on the (former) planet Pluto, or mistaking the shadow of a tree for a bear; it’s all pareidolia. In 1987, San Diego artist Edna Harper experienced this phenomenon when she looked at a cape honeysuckle vine in her garden and saw the shape of an elephant. Instead of smiling at a moment of whimsy and moving on, like the rest of us might do, Edna told her husband she thought she might be able to shape the vine to look like an elephant. Her husband, Alex, laughed, and told her that if she managed it he would pay for a gardener and the water needed to maintain it. Not one to back down from a challenge, Edna shaped the vines to form two elephants: a large elephant with a little boy sitting on its back, and a smaller elephant with a monkey on its back. These elephants are still standing in Edna’s yard today, although they’re now accompanied by four more elephants, a camel, a surfer, the three pyramids of Giza, a dinosaur, a serpent, a whale, a bear, a rabbit, the Loch Ness monster, and much more, all shaped out of cape honeysuckle. Edna shows Staypineapple around her topiary garden and tells us more about her creations. Now known as “Edna Scissorhands” (and can we take a moment to appreciate that name? ), Edna has achieved some fame for her creations. 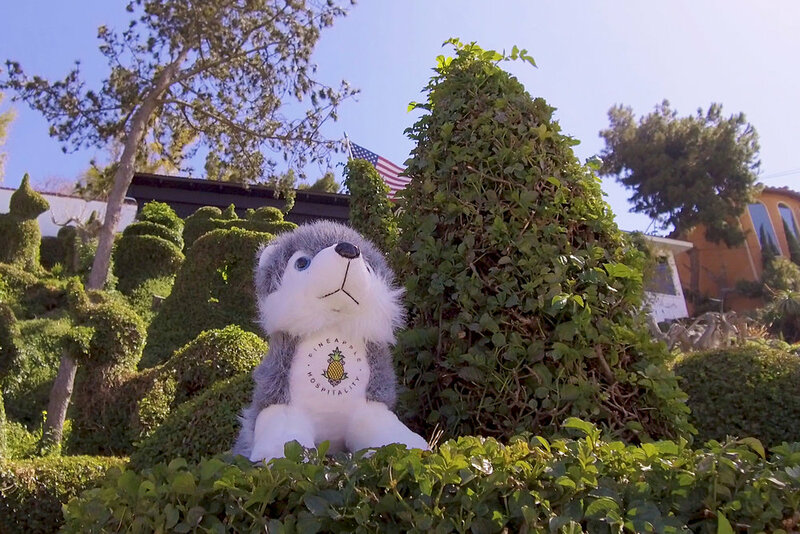 Harper’s Topiary Garden, as the garden has been named, draws locals and tourists from all over the world to Edna and Alex’s suburban front yard. Each topiary in Edna’s garden takes at least five years to shape into the image in her mind. A lot of the work she does herself, although her husband did come through on his promise of a gardener. Many of the pieces are influenced by the Harpers’ travels, like pyramids of Giza, the Loch Ness monster, and those first two elephants. So, while you’re staying at Hotel Z in San Diego, head down and find a bit of whimsy (or pareidolia) in the Harper’s Topiary Garden. Unlike most topiaries, Edna’s creations have no internal wire structure, so they are incredibly delicate. Please respect her work and admire it from the street. Just keep in mind that the garden is private property, so please don’t walk in the garden or touch the topiaries. The Harpers’ address is 3549 Union St, San Diego.